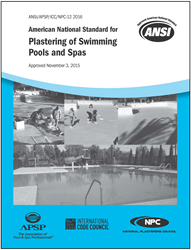 The Association of Pool & Spa Professionals (APSP) announces that the American National Standards Institute (ANSI) has approved the ANSI/APSP/International Code Council (ICC)/National Plasterers Council (NPC) –12 2016 Standard for the Plastering of Swimming Pools and Spas. ANSI/APSP/ICC/NPC–12 2016 Standard for the Plastering of Swimming Pools and Spas covers the material and application for the plastering of cementitious finish coatings for in-ground swimming pools or other cementitious water-containment vessels. It sets forth the identification and stipulation of non-structural cementitious finish coating materials for usage in plastering, the application and finishing methodologies based on common accepted trade practices and the installation of non-structural cementitious interior finish coatings for in-ground swimming pools or other cementitious water-containment vessels. The NPC views ANSI/APSP/ICC/NPC–12 2016 as a standard that delivers on the mission of the overall organization. “This is the beginning of the NPC’s education of the architectural community and other likeminded professionals about the very best in pool plastering practices. We applaud APSP’s leadership and support in getting this completed,” said NPC Executive Director Jeff Henderson. For more information about the Standard, contact DiGiovanni at cdigiovanni(at)apsp.org. To purchase it visit APSP.or/Store. The National Plasterers Council (NPC) is an international trade association dedicated to advancing the research, application, care, and maintenance of cementitious interior pool finishes. The NPC is committed to bringing comprehensive information about pool plastering characteristics, applications, design and technology to users, product designers, engineers and architects. Further, NPC is focused on enhancing the ability of its members to meet the emerging demands of the market through sharing knowledge and best practices. For more information visit http://www.npconline.org. For questions regarding this press release, or the National Plasterers Council in general, please do not hesitate to contact NPC headquarters at any time. Our email is nationalplastercouncil(at)gmail.com and our phone number is (847) 416-7272.